Many individuals from communities of color experience unique challenges when coming out to others with their sexuality and gender identity/expression and as a result the coming out process can be even more difficult. At the LGBT Resource Center, we acknowledge and recognize the hardships for some students of color and we strive to promote inclusiveness to the USC LGBT Community through events, educational discussions and training sessions. 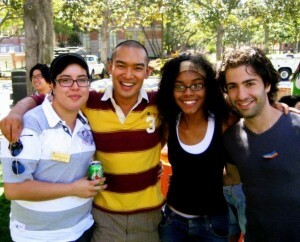 We respect the diverse identities of every fellow Trojan. Queer People of Color – USC Queer People of Color is the first club to focus on the Minority Groups which lie within the LGBTQIA community. The center works closely with the ethnic-specific cultural centers on campus when the LGBT-perspective is presented at their different events. In addition, mini resource kits are at every cultural center and are updated by the LGBT Resource Center monthly with upcoming information about events and other LGBT-related activities. The cultural centers include The Asian Pacific American Student Services, The Center for Black Cultural and Student Affairs and El Centro Chicano.